Today was fun. I boothed at the Totem Park Commons Block where 1st years live, and engaged in dialogue with dozens of people. I also gave them the option to sign the petition to raise the rates if they were interested. What I experienced this evening was a reminder as to why we need to create awareness, and why we need to engage in dialogue to create a safe space for people to learn, make mistakes, and get thinking. Today, I had dozens of conversations with students at UBC – educating them on the poor welfare state BC has. I heard many comments like: “these people are lazy and need to find work”, “if we increase welfare rates then our taxes will go up”, or “increasing welfare rates will mess up the economy” and more. People even gave me advice on how to spend my $21 a week more efficiently. But the fact is that $21 is simply not enough money. I am a healthy, resourceful individual who even has some culinary training at the Arts institute, and I know how to use my $. Overall, this evening was a great energetic reminder that awareness is needed, especially at over privileged place like UBC. This evening reminded me that the work I am doing is needed, because many people are still not aware of these social problems, and education is the key to create more safe spaces and improve our welfare state. So I apologize if I came off as aggressive or pushy when trying to reach my points because I do want you to learn – however, I acknowledge that if I am angry – well, its hard for you to get my message. I will work on this. But thank you, everyone for stopping by at my booth to engage in amazing conversation for the past four hours! 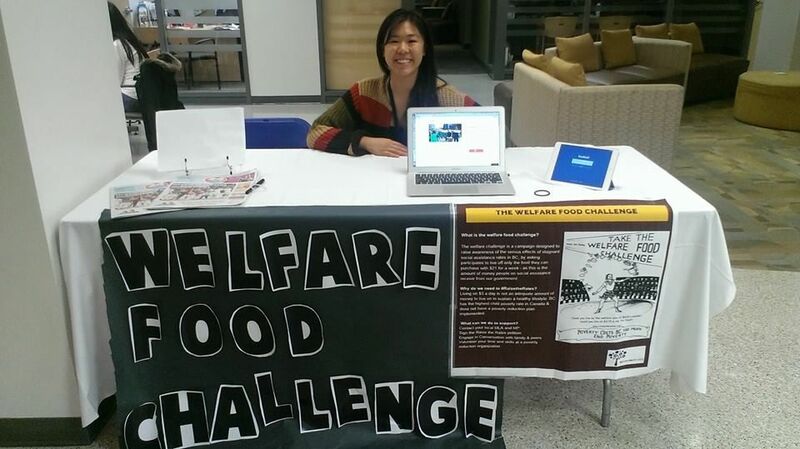 I have just two more hours left until this challenge ends, and I can truly say it has been humbling and the start to my education and advocacy in increasing welfare rates. Category: 2014 Day 7, 2014 Welfare Food Challenge, 2014 WFC Participant Blog Tags: Samantha T.